These are not your father’s manufacturing jobs. Onshoring is generally viewed as a positive turn, a corrective to the job losses of the past 20 years. Towns that lost thousands of jobs after NAFTA, where empty factories still stand, could benefit from a manufacturing boom. But the quality of the compensation raises the possibility that in the globalized economy of 2015, manufacturing can no longer provide the standard of living that Americans seek, and America will need to find a different way to restore the middle-class strength it once knew. The Spring Hill GM plant is perhaps an example of the best that onshoring can bring. The plant is unionized and the jobs—with their profit-sharing perks and high-quality health care—are good ones. This is true even for the plant’s so called “second-tier workers”—new hires who get paid substantially less (topping out at $19.28 an hour) than the long-time workers (at $28 an hour), in a system the union agreed to during negotiations in 2007. Crystal Conklin had lived paycheck to paycheck, working odd jobs in retail office work, before she was hired as a second-tier worker at the Spring Hill plant a few years ago. Thanks to her $18 an hour wages and subsidized health insurance, she was able to save up enough to buy a car last year, and also bought a house. She wants her 17-year-old son to start working at Spring Hill while he goes to community college. It may be no accident that Spring Hill is one of the American cities where the gap is smallest between the highest-paid and lowest-paid workers, according to NerdWallet; the average household income for the top 20 percent of workers is $157,191, while the average household income for the bottom 20 percent is $26,735; the middle 20 percent made $74,214. Though those differences may seem big, they’re among the smallest in the nation; thanks in part to the union, there isn’t as much income inequality as in other U.S. cities and towns. But not all American manufacturing jobs can provide the sort of security that Conklin achieved. 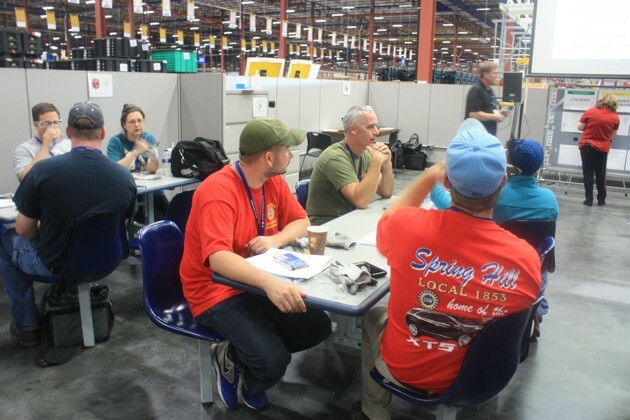 One man, who works for parts supplier Magnetti Marelli, which opened its first lighting-production plant in Tennessee in 2013, told me that employees are required to work 12 hours a day, seven days a week. For this, they earn $12 an hour. 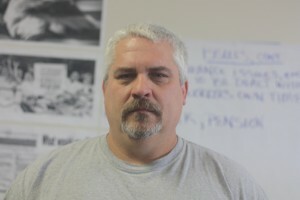 The man, who didn’t want his name used for fear of retribution from the company, said the job has scarred his hands because he has to work quickly with wire harnesses, but that he can’t quit because he has a family to support. “The labor laws in the United States ought to stand up and say you can’t do this to a human being,” he told me. A spokesman for Magnetti Marelli, which is owned by Fiat Chrysler Automobiles, said that the schedule is related to a ramp-up phase ahead of new-product launches. Magnetti Marelli, like most manufacturing plants in the South, is not unionized. And those who work at such plants likely won’t see the sort of mobility that Conklin has experienced. The compensation for these jobs is not on step with today’s economy: Wages for workers at non-union automotive plants have fallen 14 percent from 2003 to 2013, when adjusted for inflation, according to the National Employment Law Project. There are many reasons for companies to move manufacturing back to the U.S. Wages are rising in China, and many companies find it difficult to control the quality of goods made there. 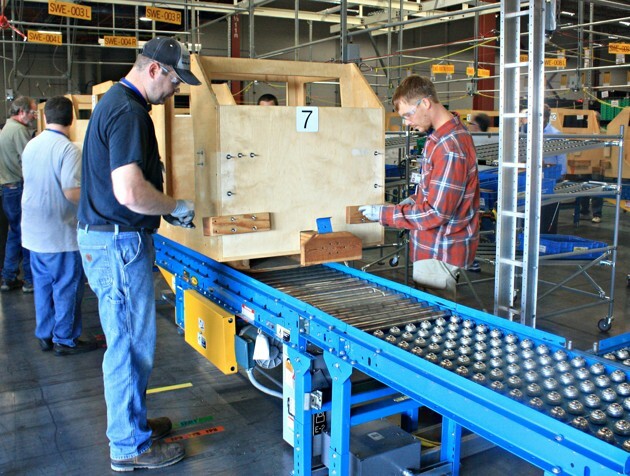 It takes a long time to make something overseas and then ship it back to the U.S, so locating in the U.S. can speed up production. In the U.S., companies can make small batches of goods, test consumer demand, and quickly adjust accordingly. Darius Mir grew his business 9to5 Seating, which makes office chairs, by moving manufacturing from California to China in the early 2000s. But manufacturing in China became increasingly challenging. The global slowdown shuttered dozens of plants in China, and some skilled workers went home to their villages, Mir told me, so that the company had trouble finding good employees. What’s more, as China devalued its currency, 9to5 Seating had to spend more on wages because of the unfavorable exchange rate, making it less cost-efficient to produce goods in China. Looking for solutions, Mir did some research and realized that if he could locate a plant somewhere in the central U.S., where he could ship goods to customers in a day, and if he could automate some jobs to save labor costs, producing chairs in the U.S. could work. Thanks in part to automation, he found, a task or order that would take 22 people in China can be done at the Tennessee plant with five. With the help of generous incentives, the company started manufacturing on 100,0000 square feet in Union City, Tennessee, where Goodyear had closed a massive plant in 2011. Mir is now adding 200,000 square feet of space to ramp up manufacturing in the company. (The U.S. part of the company is called Made In America Seating). He employs 40 people, and hopes to grow to 80 by the end of the year, and 500 within five years. The average wage, Mir told me, will be $38,000 a year, and unskilled employees will start working at $11 an hour. While wages of $12 an hour are much higher than Tennessee’s minimum wage of $7.25, they represent a significant drop in pay for jobs in manufacturing, which were once a pathway to America’s middle class. This is the disappointment of 21st-century onshoring: Though some of the jobs coming back to the U.S. require advanced degrees and skills, and are the good jobs pundits predicted would return, many are not. Today, more than 600,000 manufacturing workers make $9.60 an hour or less, and one in four make $11.91 or less, according to the National Employment Law Project. Manufacturing workers once made more than average U.S. wages, but by 2013, they made 7.7 percent less than the median wage for all occupations. And when adjusted for inflation, wages for manufacturing workers have declined 4.4 percent between 2003 and 2013, according to NELP. Lower wages are centered in the South, where lax labor laws and an oversupply of workers allow companies to pay less. This is perhaps most evident in the most productive auto plant in the country: a Nissan plant in Smyrna, Tennessee, 40 miles west of Spring Hill. Nissan has made cars in Smyrna since 1983, and the town, and even the county, grew up and prospered around the plant, adding nearly 200,000 residents since the plant opened. But Smyrna suffered during the recession when Nissan, facing huge financial losses, offered buyouts to 6,000 employees in Tennessee and eliminated a night shift. The unemployment rate in Rutherford County reached 11 percent, and did not fall below 7 percent until late 2011. When Nissan ramped up again after the recession, they hired low-paid temporary workers through agencies such as Yates Services. Still, Bruhn gets less of a bonus and a lower wage than other full-time Nissan employees. “There’s no way to reach the top here,” he told me. Josh Clifton, a Nissan spokesman, responded that the use of staffing agencies is “standard practice” in the automotive industry, and that Nissan employees in Smyrna receive competitive pay and benefits). While Nissan will not disclose how many of its workers are temporary, Ed Ensley, a worker who has been at the plant for 30 years, says he thinks only about 30 percent of current full-time workers are Nissan employees. Ensley is a full-time Nissan worker, but he wants to form a union at the plant because he’s disappointed in how morale and quality have suffered since the increase in temporary workers. This is something he’s made clear at the plant, by giving speeches in the lunchroom and by approaching executives from Japan about the need for a union. So far, he hasn’t made much progress, even as he’s seen the town of Smyrna deteriorate. Some new hires are making less than what he made in 1982, Ensley told me. Along the main drag of Smyrna, there’s been an uptick in payday-loan stores, and Nissan recently instituted a cell-phone lot for people picking up family members from work; Ensley suspects the change is because so many employees can no longer afford to be two-car families. Meanwhile, the Smyrna plant is becoming the most productive in the nation, and last year produced 648,000 cars. Nissan made $1.57 billion in the first quarter of this year, a 58 percent increase from the previous year. Nissan and other manufacturers who pay low wages may not be able to keep up the practice—both Ensley and the Magnetti Marelli employee told me there’s a lot of turnover at the plants, and that many nearby workers now know where to avoid working. Now that GM is hiring, many auto workers may try to move from lower-paying jobs to the union jobs at GM. But not all of them will be able to do so. I visited the GM plant and saw people waiting, hopeful, for job interviews, and new employees getting trained along a conveyor belt. Such scenes are reason to be optimistic about manufacturing in the U.S. economy. But I also drove down the main streets of Smyrna, which are filled with empty storefronts and check-cashing stores. Whether our new manufacturing towns will look like Spring Hill or Smyrna will depend on the successes of unions in organizing there, and whether local leaders will continue to give big incentives for companies that create bad jobs. While those factors play out, the return of manufacturing doesn’t necessarily mean that the middle class is on its way back, too. It may be that most new manufacturing employees in the U.S. will just be added to the ranks of low-paid, overworked Americans trying to get by.